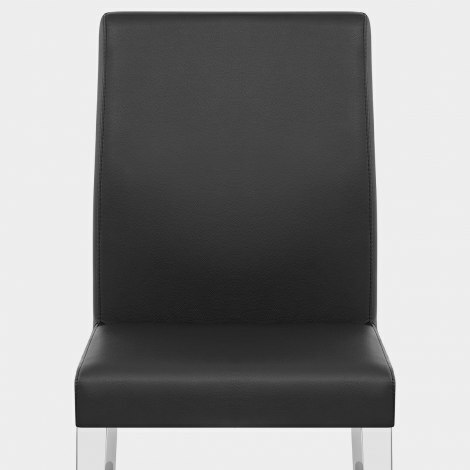 The Dash Dining Chair Black radiates style, and fuses modern design with a traditional structure. Stunning in its simplicity, the Dash Dining Chair will remain a fashionable piece for years to come, courtesy of its contemporary class and refinement. Showcasing a high backrest for seated support, the sumptuous seat is covered in black faux leather that will suit a variety of decorative styles. Padded for the upmost comfort, the seat is suspended on four stylised, polished chrome legs. Solid and sturdy, the legs have a thick rectangular shape that gently tapers to the floor for an eye-catching look. In addition, each of the legs includes protective pads beneath them to help look after your surfaces, and finalise the extensive practical features that the dashing Dash possesses. "Brilliant choice, quality, service and delivery service"
Look good and very sturdy. Easy to assemble. Delivery when expected. Very stylish and comfortable I expected them to come ready assembled but very easy to bolt together. Very happy with the quality and delivery of the chairs. We were very satisfied with everything from the telephone ordering, the quality and the delivery. Brilliant choice, quality, service and delivery service. I researched my choice of chair and others and was impressed by what I read. I decided on this chair and took the plunge and ordered. I got notification immediately of my purchase advising me of date and time of delivery. The tracking system was brilliant and if I wanted to I could track each driver before my chairs were delivered. The chairs were packed well and when I got them all in position was thrilled they looked so good and comfortable. I have to say the whole experience has been great. If you are wondering whether to make the decision on buying anything from Atlantic have no fear they are a brilliant company to purchase from.